Medium size measures 9 x 10 x 8-inches. The Oxbow Timothy Club Timothy Bungalow is a completely edible, hand-woven enclosure made from nothing but Timothy grass. The Timothy Bungalow offers your small animal a place to curl up and get cozy, whether it's inside or outside of the cage. Should your pet get hungry, the high-fiber 100% natural Timothy Hay is the perfect snack. What is the Timothy Club Process? The Oxbow Timothy Club process is a step by step, quality control process, that ensures the Oxbow Timothy Club accessory you purchase is everything you've grown to expect from Oxbow. 100% natural, no chemicals added. Drying as soon as possible after harvest helps to maintain color and aroma. After drying, each bunch is sorted by hand. The perfect material thickness is achieved by softening and rolling the hay by hand. 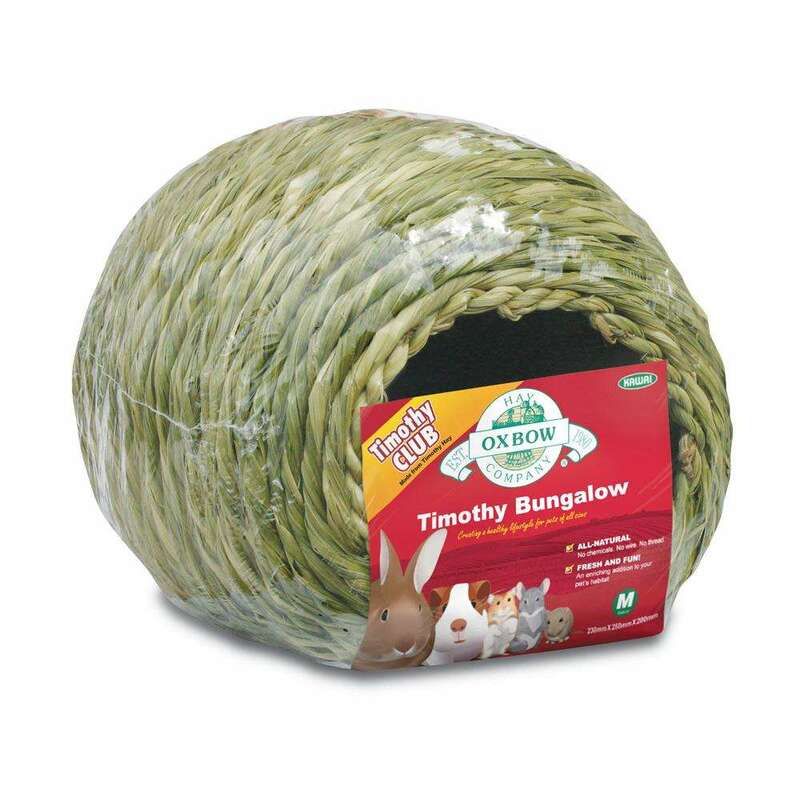 Only 100% Timothy grass hay is used to create Oxbow Timothy Grass accessories. Drying the finished product again helps maintain freshness. Finally the finished products are stored in a specially climate controlled room, keeping the product fresh providing quality assurance.